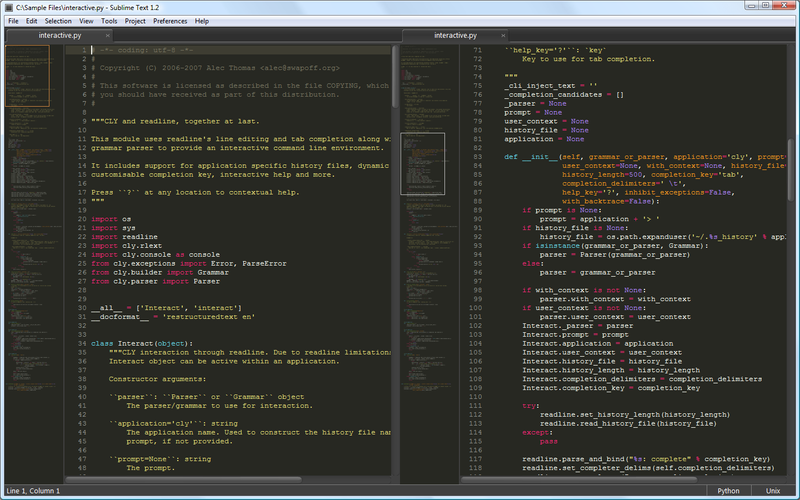 Sublime Text is a sophisticated text editor for code, html and prose. Slick user interface and extraordinary features, such as Minimap, Multiple Selection, Python Plugins, Code Snippets, and more. Fully customizable key bindings, menus and toolbar. TextMate themes and snippets are also supported. It support anything a programmer might need, with simple interface and any key combination binding. Regular expression search and replace are also supported. I *did* pay for this beta, when it was still an alpha. I *did* replace Notepad++ by it and, since it supports Vim emulation, I even don't touch my GVim too often anymore. This *is* a beta, but it is worth every cent. Lean and fast but still mighty. 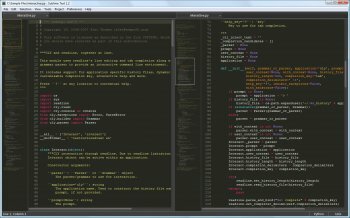 Notepad++ is no comparison anymore. Sometimes paying for something good pays out. My main complaint is the cost. This IS a beta after all. I like the left hand column showing the document with a page view square over it. Very nice feature. But really, let us at it for free and mebbe, just mebbe, we'll migrate from Notepad++. Once you have a decent userbase you can think about how, if at all, you can make money out of this.